Correlating ‘Cost of quality to ‘Cost of communication’. Having developed, managed and implemented product quality strategies and programmes in the technology industry for 17 years I’m no stranger to looking at the product development lifecycle, seeing where the main source of quality issues come from and then putting appropriate Corrective and Preventive action processes in place. As a mediator I have been examining the impact that communication and collaboration has in our daily lives and the broader implications for business. In thinking of mediation I see it as the last step in trying to deal with a problem before it is taken out of your hands (in courts) and you no longer have control of it. Similarly with Quality, a problem can be contained within a factory before it gets delivered into a customer’s hands. As I think about how a quality issue can be prevented by working proactively to ‘build quality in’ early in the product lifecycle, I am looking at how mediation and legal proceedings can be prevented by working proactively to build relationships, strengthen communication and minimise the potential of moving through the conflict escalation lifecycle. 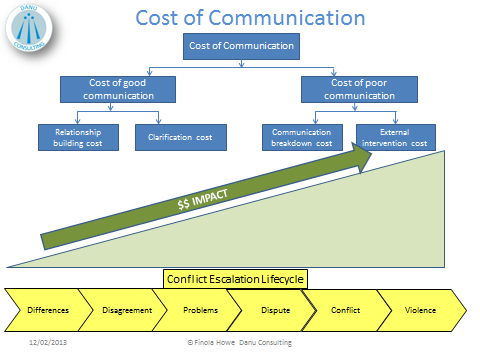 Reflecting on the ‘Cost of Quality’ model has enabled me to develop a correlating ‘Cost of Communication’ model in tandem with the conflict escalation lifecycle. Because ‘lack of quality’ costs money, in terms of customer dissatisfaction, lost sales, repairs, warranty etc, it’s very easy for us to see that it’s something we need to fix. Businesses think about their customers and the quality of the product or service they offer, they know that poor quality will affect their bottom line and so quality becomes a very tangible thing to look at in monetary terms. The ‘Cost of quality model’ is where we try to quantify how much money is spent reactively managing quality issues that have escaped out into the field and also how much is spent proactively ensuring quality issues do not occur. Intuitively we know that it costs much less to put all the right processes in place to proactively assure product quality early on in the product development lifecycle, rather than trying to manage customer dissatisfaction, brand damage and underlying monetary impact of a product recall due to a quality issue in the field. I believe the same principal holds true for communication and collaboration in business, although lack of it is not nearly as easy to measure as lack of quality. I think communication and collaboration are as much of a success factor for a business, as having a high quality product or service. The alignment, creativity and speed of progress that comes from communicating and collaborating with people you have a good relationship with is priceless. Time spent upfront to build solid relationships and develop trust is time well spent for a lifetime. Standing back and taking the time to clarify misperceptions and misunderstandings proactively, trying to see things from another perspective as soon as there is a hint of something not feeling right, intuitively costs less both emotionally and monetarily (in terms of disruption to the business as well as potential legal costs). As with solving quality issues, the same is true for solving communication issues – the key is to ‘nip it in the bud’ – recognise the potential sources of an issue and spend the effort and time to proactively put prevention processes in the right places as early in the lifecycle as possible.